Ok, I don’t usually blog about something this silly (or isn’t it silly? 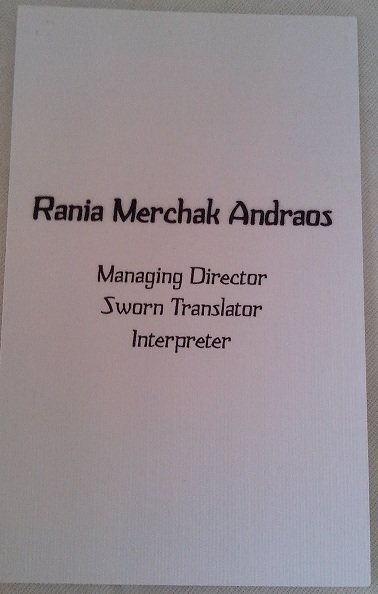 I don’t know), but I’m just in love with my new business cards! This is really the first time since I started my business back in 2008 that I absolutely love how my business cards turn out. I used to have the design made by third parties and I was never too keen on it, but I had to stick to it (for some reason, don’t ask me what it is!). This time around, I decided to give it a go and work on the design myself. I tried to keep it simple but with a twist. I did stick to the rather common rectangular shape, but I decided to make the card vertical! I know, I know, it’s not rocket science and it’s not really knew; but hey, I’ve been given tons and tons of business cards, and none of them were vertical! They were all horizontal. What’s also new this time is that I decided to include a few social media logos on the front side: Facebook, Twitter and LinkedIn (although I do have accounts on Pinterest, YouTube and Google +, too, but I’m not that active on them; something that I should be really working on – yeah, let’s make that a new year resolution!). 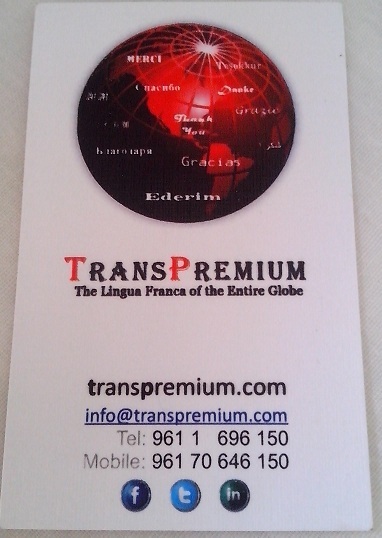 Anyway, if you type “TransPremium” in the search bar of any of the aforementioned social networking sites, you’ll find me 😀 . At first, I had chosen square-shaped logos, but my hubby (who has designed several cards before) opted for the round ones to match the round logo of my business. How come I didn’t think of that? I guess it’s always better to have several opinions and, mostly, to be open for other ideas! Just like any business card, you have got to mention your contact information (website, email address and phone numbers). Since this is obvious, I won’t go there. As for the back, I wanted it super simple: just who I am and what I do. There you have it, the most simple, elegant and straight-to-the-point business card, to be read vertically; and I’m loving it!